Барааны дугаар 9781107657823. Categories: CAMBRIDGE, International Examinations | English Resours. 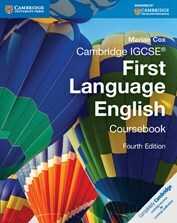 Cambridge IGCSE First Language English Coursebook (fourth edition) is designed to support the Cambridge IGCSE First Language English (0500) and Cambridge International Level 1 / Level 2 Certificate First Language English (0522). A student-friendly resource Cambridge IGCSE First Language English Coursebook (fourth edition) teaches the reading and writing techniques required for the Cambridge IGCSE, as well as providing two bespoke units on speaking and listening techniques, plus embedded activities on these skills throughout. It includes carefully designed activities on a variety of engaging topics, set out in 14 lively, full-colour units. A dedicated microsite for Cambridge First Language English provides free online resources to support the course, including answers to the Coursebook activities.